Poncho Records have become quite a name in the Canadian underground over the last year or so. We have previously reviewed a couple of their acts in Harley Alexander, WHOOP-Szo and Walrus, and definitely enjoyed what we were hearing. Now it seems like there’s an uprising of psychedelic music in their home city, hence the release of Poncho Records Compilation Vol. 1. This compilation features tracks from nineteen different acts, twelve of which are responsible for the psych-movement in Halifax, and seven bands who are just passing by. Once again Walrus and Harley Alexander deliver tracks that keep me excited to be a fan of both projects and for the other seventeen bands, there’s a real driven quality to show to everybody not living in the city just how strong and good this movement of psychedelic rock actually is. Psyche Tongues open the compilation with Remain Unknown which is a catchy little number that perfectly blends the eccentricities of psychedelic rock with the accessible moments of pop music. 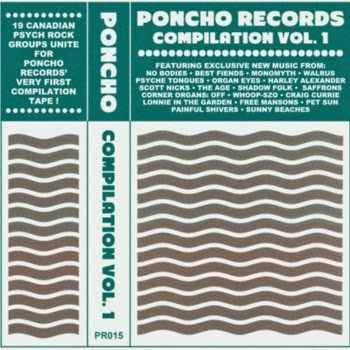 Other highlights come from the likes of previously unknown bands Shadow Folk, The Age and Sunny Beaches but as a whole the Poncho Records Compilation Vol. 1 is definitely a cohesive collection of some very good music. Poncho Records have definitely helped mark this movement into history with this release, and there’s nineteen different bands on it, so it’s kinda necessary to check this out. For more music reviews, free downloads and complimentary ponchos check out Exploding Head Syndrome on Facebook and Twitter.